Vertical and rotatory car park system has the structure that stacks and rotates cars like an over sized ferris wheel. This structure stack system is known as P+ Smart Parking System. The giant structure measures 17 m high and holds up to 16 vehicles. Drivers can use the service with or without the parking attendant’s help and your car travels down to you in only 90 seconds. The flexible parking systems can be setup indoor or remain free standing. The Smart Parking system could be part of the answer to how to quickly and efficiently process multiple cars for parking in increasingly crowded urban spaces. Requiring less than 5 days for setup, the structure can rotate both clockwise and counterclockwise. Most important for the client, it offers the flexibility to be used permanently inside a building or simply as a free-standing unit. 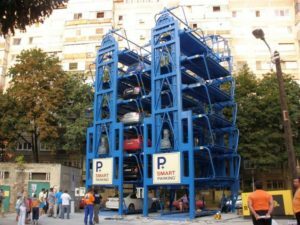 It is constructed by Smart Parking Solution Inc that offers compelling vertical, robotic parking solutions and automated parking systems to the challenge of limited parking space. It is the future of robotic parking solutions. It’s more expensive to build out than to build up. They are packed with latest technologies addressing the growing problems of limited parking space by utilizing robotic car parking systems in areas where crime, congestion, ,zoning are problems and where land is too expensive.